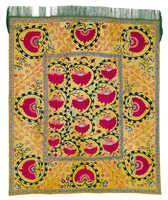 This gorgeous Lakai suzani embroidered on a golden yellow silk foundation was probably made in the area around the city of Samarkand. This regional attribution is suggested by the generous composition and the dimensional ratio of the border and central field. There are various indications of a provenance among the Uzbek Lakai tribes: the specific style of drawing, individual designs such as the botehs divided in two by colour change and the lancet leaves, the colour combinations (e.g. light blue, aubergine and light green in juxtaposition), the delicate embroidered seams, and – a particularly characteristic feature – the detached motifs of the main border. – A dark blue stem bearing plain dark blue leaves grows diagonally from the lower left corner, branching off into many tendrils across the whole of the field. Thirteen large, pink and rose fan-shaped blossoms are suspended from it, their tips curving in a striking sickle shape. Larger-scale blossoms of the same type encircled by blue stems appear to float freely in the wide border, interspersed with delicately drawn, elongated diagonal stems, each bearing thirteen small, stylised blossoms resembling hooks. Two narrow guard borders contain blue vines with light-blue flowers. – The six-panel foundation is a golden yellow silk taffeta, probably imported, onto which the design has been embroidered directly, without using an additional layer of cotton fabric. The extraordinarily fine embroidery is in the rare "chinda khayol" technique where the threads run exactly perpendicular and parallel, creating a hermetic surface of slightly relief-like appearance which achieves an iridescent moiré effect. – Several horizontal tears in the silk foundation, good overall condition. 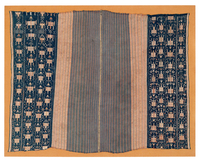 A fragment of a narrow, brown-ground garment border, finely woven in wool and cotton in the slit tapestry technique. The highly abstract, geometric design in subtle pastel shades consists of pyramidal shapes composed of polychrome bars, arranged in an in-and-out rhythm, as well as stepped polygons. The narrow border shows a white undulating line on a brown ground. – Two joined sections, small holes, good overall condition. Mounted onto fabric and attached to a wooden support with a perspex frame. 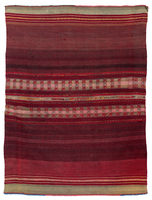 A ceremonial cotton hanging in a long and narrow horizontal format with a brocaded design. The beige-ground field depicts 36 two-tone ancestor figures in red and blue, placed in two rows exactly one above the other. A horizontal blue border runs between the two tiers. The parallel borders at the upper and lower ends display a continuous wave design. Palepai textiles played an important role during the wedding ceremonies of the Paminggir people of Lampung, an area in the south of the island of Sumatra. – Partially faded colours, otherwise in good condition. Mounted onto fabric.